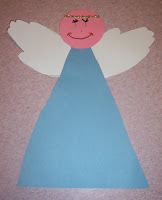 This angel is very easy to make, great for little ones. This is actually from the Handicrafts book mentioned in an earlier post. 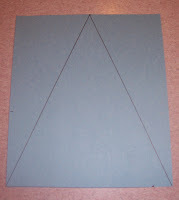 First give each child a triangle pattern on a piece of construction paper. Let them cut this out. Next let the children cut out a circle for the head, or you may have one ready. Let them draw a face. Add glitter for a halo. I love this! 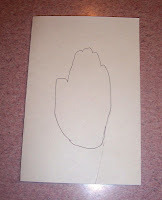 Quick & easy and you can work in learning about 2 shapes!